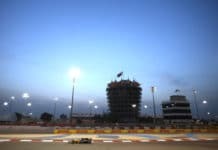 Bah…rain indeed, a race in the dry, and whilst it wasn’t high drama it proved the versatility of formula one, with a race being won not solely on being the fastest but on also being the best at stopping. Ross Brawn proved what we all know; he is an amazing strategist and sorely missed over at the red garage, whilst Toyota threw away their chance to make history with early stops and bad tyre choices leaving Jense to take the massive trophy with his superb driving skills and sunglass wearing prowess. Down on the grid there was a veritable fashion parade, starting with DC and Jake Humphrey’s matching outfits, although it was a dismal shirt choice from Eddie Jordan, where is the satin number from Melbourne? Then we had a treat when DC donned shorts to tackle a trip round the track with Brundle and it was all topped off with Bernie wearing a Santander jacket….even Brundle thought he looked like a loser and was so embarrassed for him he couldn’t bring himself to talk to him. But anyway, it’s a car race not a fashion parade (but seriously did you see the jacket?) so, after a short break I’m back and so’s my Badgerometer! In at one is the pre-race LOVE-IN that was happening on the grid. Eric Clapton seemed delightful and the Crown Prince of Bahrain looked as though he was going to give Brundle a bear hug and then refused to state his favourite instead wishing for a safe race. He’s a better human than me, I live for the crashes, hence why I love rain! Next Brundle skipped over to ‘Daddy Button’ (his words not mine), and stated that Jenson is a nicer person now he’s winning and didn’t land up with an earful, instead a hearty agreement, that in fact the driver is much easier to live with these days. Daddy Button also joined in with the fashion show sporting some uber trendy ray-ban aviators or ‘avies’ as they are known over in South Africa. Next it was some music advice from Rubens Barrichello, the revelation Glockdog listens to David Hasslehoff and finally even a deflated Massa agreed to chat, and all that in immense heat and with everyone under a fair bit of stress. It was like a sunny day in London when all of a sudden its ok to talk to, smile at and laugh with strangers because the sun is out, any other time of the year and you’d be sectioned for sure. 'The John Button look' - the ideal "brit abroad"
In at two is Lewis Hamilton, and finally we can safely say he is a human being. When asked by Jake Humpreys if he still enjoyed being a formula one driver he was honest enough to say no and he admitted the car is a heap of sh*t, ok he actually said its not such a great car at the moment, but that’s what he wanted to say. And really how bad does that make you feel, that someone who was adored last season, won the championship and really has dedicated his life to F1 now in only his third season doesn’t actually enjoy doing it anymore. Maybe it is hard to pity him because although on the one hand he just wants to go the cinema and eat fish and chips uninterrupted he does earn a fair wedge of cash, just moved to Monaco and has/has not got a gorgeous girlfriend (did we believe the Grazia reports in the end?). But he is a young talented man that is being crucified by the press and has seen his fans turn on him. Ok he has a rubbish car, he lied and then lied about lying and his dad is really creepy but its his championship season and he should be riding high and enjoying it. He says he isn’t going to leave McLaren and that they are a strong team through thick and thin but why during thin times does it always seem to be Lewis who shoulders the backlash. I can’t help feeling he might be better off elsewhere, somewhere he wont be tarred with controversy and dishonesty and left to apologise on his lonesome. But top marks Lewis for being honest, human and admitting you made a mistake. Three is Kimi Raikkonen for the exact opposite reason Lewis Hamilton is in the Badgerometer this week, he doesn’t apologise, he knows he has a rubbish car, a rubbish team and no real hopes for shining this season and he simply doesn’t care anymore. It all started in Malaysia when whilst the other drivers remained on the track waiting to see if the race would continue, Kimi flounced off, got changed and nabbed himself a magnum ice-cream. Last weekend in Bahrain he mumbled about problems with the Ferrari whilst his eyes screamed ITS RUBBISH I AM ONLY HERE FOR THE MONEY AND BECAUSE ITS EASIER TO GET LAID. Even DC questioned Kimi’s commitment away from the track and the F1 badger podcasters chatted in episode 3 about the likelihood of Kimi retiring after this season. Personally I don’t even think it will come to that, apathy will get him long before he actually has to state his retirement and he simply wont get up off the bar stool one Sunday. Its Massa I really feel for, the title snatched from him last season and what hope for glory does he have this season when he’s being lapped by Jensen Button and limping home to a team spiraling into depression and disaster. Four is the crazy world of F1 punishments and how ‘topsy-turvey’ they are. In F1 world murder a puppy and you get given three more, run over a daffodil and that’s it you’re out for ever. So Sutil wrecks the race for Webber and gets demoted three places, but back in Melbourne when Vettel and Kubica had an ACCIDENT Vettel was caned for it, losing his pocket money (no football stickers for him that week) and getting knocked down places on the grid. Also McLaren did a really low and dishonest thing and got a suspended sentence. Its just all so inconsistent but really funny and definitely leaves much need for much loved badger pies of possibility. KERS - The curse of the 2009 season? This week I am miffed with KERS, I am not just miffed with it I am bored to tears with the way it is being slogged and slogged as being worthwhile when clearly it isn’t. It took Jenson Button just over an hour and a half to finish the race and in that time with 18 cars on the track there was ONE example shown of KERS being worthwhile when the system made it difficult for Barrichello to overtake Piquet, however it was overlooked that Rubens was full of fuel having just pitted and overall Rubens finished 5 places above Piquet, really what is the point of this system? And finally what on earth was Eddie Jordan blathering on about when he described Trulli’s ‘locked away self destruct button’?